30 THE SHOP MARCH 2019 30 THE SHOP MARCH 2019 Ways to combat OEMs' desires to limit new-vehicle accessorization. 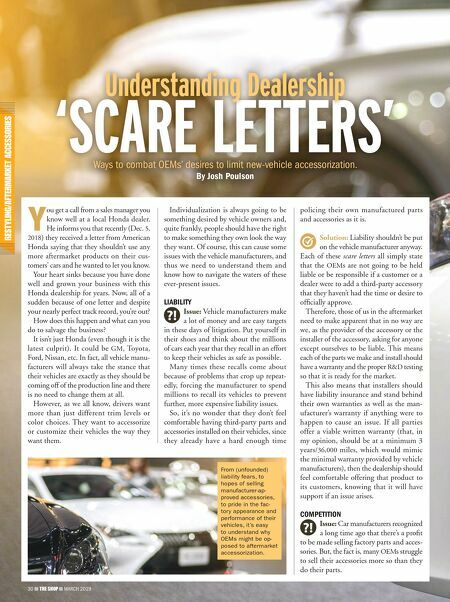 By Josh Poulson 'SCARE LETTERS' Understanding Dealership Y ou get a call from a sales manager you know well at a local Honda dealer. He informs you that recently (Dec. 5, 2018) they received a letter from American Honda saying that they shouldn't use any more aftermarket products on their cus- tomers' cars and he wanted to let you know. Your heart sinks because you have done well and grown your business with this Honda dealership for years. Now, all of a sudden because of one letter and despite your nearly perfect track record, you're out? How does this happen and what can you do to salvage the business? It isn't just Honda (even though it is the latest culprit). It could be GM, Toyota, Ford, Nissan, etc. In fact, all vehicle manu- facturers will always take the stance that their vehicles are exactly as they should be coming off of the production line and there is no need to change them at all. However, as we all know, drivers want more than just different trim levels or color choices. They want to accessorize or customize their vehicles the way they want them. Individualization is always going to be something desired by vehicle owners and, quite frankly, people should have the right to make something they own look the way they want. Of course, this can cause some issues with the vehicle manufacturers, and thus we need to understand them and know how to navigate the waters of these ever-present issues. LIABILITY Issue: Vehicle manufacturers make a lot of money and are easy targets in these days of litigation. Put yourself in their shoes and think about the millions of cars each year that they recall in an effort to keep their vehicles as safe as possible. Many times these recalls come about because of problems that crop up repeat- edly, forcing the manufacturer to spend millions to recall its vehicles to prevent further, more expensive liability issues. So, it's no wonder that they don't feel comfortable having third-party parts and accessories installed on their vehicles, since they already have a hard enough time policing their own manufactured parts and accessories as it is. 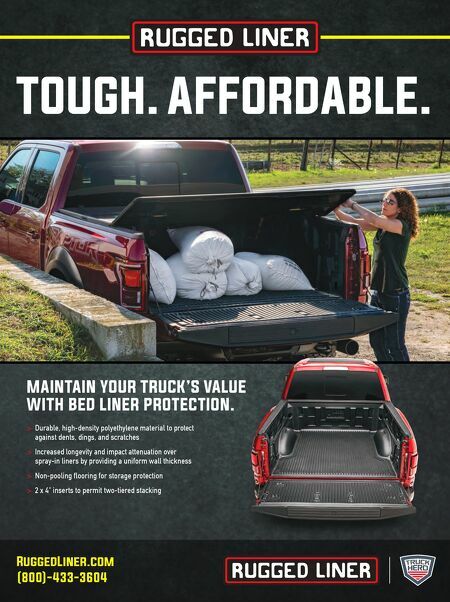 Solution: Liability shouldn't be put on the vehicle manufacturer anyway. Each of these scare letters all simply state that the OEMs are not going to be held liable or be responsible if a customer or a dealer were to add a third-party accessory that they haven't had the time or desire to officially approve. Therefore, those of us in the aftermarket need to make apparent that in no way are we, as the provider of the accessory or the installer of the accessory, asking for anyone except ourselves to be liable. This means each of the parts we make and install should have a warranty and the proper R&D testing so that it is ready for the market. This also means that installers should have liability insurance and stand behind their own warranties as well as the man- ufacturer's warranty if anything were to happen to cause an issue. If all parties offer a viable written warranty (that, in my opinion, should be at a minimum 3 years/36,000 miles, which would mimic the minimal warranty provided by vehicle manufacturers), then the dealership should feel comfortable offering that product to its customers, knowing that it will have support if an issue arises. COMPETITION Issue: Car manufacturers recognized a long time ago that there's a profit to be made selling factory parts and acces- sories. But, the fact is, many OEMs struggle to sell their accessories more so than they do their parts. From (unfounded) liability fears, to hopes of selling manufacturer-ap- proved accessories, to pride in the fac- tory appearance and performance of their vehicles, it's easy to understand why OEMs might be op- posed to aftermarket accessorization.